A Product That Gets Results! 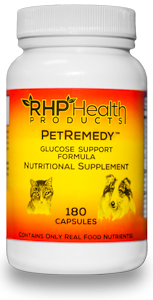 One of the major active ingredients in the RHP™ PetRemedy™ Glucose Support Formula is RevitaHealth® GTF Chromium. RevitaHealth® GTF Chromium is patented and available nowhere else. Another major active ingredient in the RHP™ PetRemedy™ Glucose Support Formula is banaba leaf extract, a time-tested and traditional herb used in Asia. Numerous studies have shown that when vitamins and minerals are in a natural form as they are found in natural foods, they are utilized more effectively by the body. That's why RevitaHealth® nutrients are better. The RevitaHealth® difference is not just about quantity, but about quality. The nutritional support provided by RevitaHealth® nutrients cannot be provided by USP vitamins and mineral salts no matter how much of them your cat takes. RevitaHealth® nutrients are a unique new generation of vitamins and minerals integrated on a molecular level to the basic building blocks of life; proteins and other food factors. The RevitaHealth® difference is not just about quantity, but about quality. When vitamins and minerals are in a natural form as they are found in natural foods, they are utilized more effectively by the body. That's why RevitaHealth® nutrients are better. RHP™ PetRemedy™ Glucose Support Formula is 100% natural and safe and because your cat's body recognizes it as food, there are no known side effects and it will not adversely interact with medications. 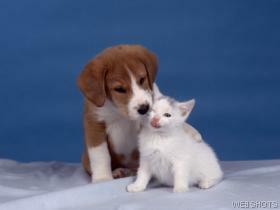 The RHP™ PetRemedy™ Glucose Support Formula is specifically designed to improve the health and life of your cat. Order your RHP™ PetRemedy™ Glucose Support Formula today and watch your cat experience the results. The RHP™ PetRemedy™ Glucose Support Formula comes with a 90-day money back guarantee on your initial order. This means that you can try the product and if not completely satisfied with your initial order, return it for a refund of the product price.